Mileage and route planners help us figure out which way and how far away our destination is. The Czech internet carries free applications and paid programs that can be used for car, bicycle, or river trips. This rather widespread application from Škoda Auto will show you how to get to Paris, for example, and how much you can expect to spend. You can enter not only the end points but also the places you want to travel through. The system will calculate both the shortest route and the easiest – and if you enter your car’s gas consumption it will also show you how much it will cost. It can also create maps for easier orientation. It stands up to similar foreign services such as the French site, www.mappy.fr, although it’s a bit less complex. Mappy doesn’t cover the Czech Republic, but it can help you with highway exits and with toll estimates. Searching for a route via your computer or mobile phone is a paid application. For tourist trips, all you need is mileage for passenger cars, ranging from CZK 500 to 1,000. More extensive menus allow you to save selected routes, variants, for bicycles, and city maps. Additionally, the expanded version is able to search out points of interest along the route. The program also calculates costs and shows the route on a map. Use is simple and intuitive, and you can work in several windows at the same time. But when you get in your car it’s better to take along an atlas instead of a computer, and the advantages compared with the free version don’t look so great that you want to pay for it. This is a mileage and route planner for bicycles. Program prices start at CZK 150 (unless you use the free version, in which you have to repeatedly enter a code). It contains detailed bicycle routes in several areas of the Czech Republic and Slovakia, with the length of the routes, places that sell food, the terrain type, and elevation. The itinerary can then be printed out. You can also plan bicycle trips on-line at www.cykloserver.cz in the “marked bike routes” section. Boaters need to plan their routes, too. This site is very simple, but only somewhat interactive. River mileages are in nice, very detailed separate files (including a recommended .pdf format). One look at them gives you the feeling that you’re already traveling. Cruises begin upstream and continue moving down with the current. Mileages are accompanied by information on water depths and obstructions. Also included are colorful descriptions of camp grounds and catering facilities. In the map section you’ll find an atypical web camera mileage system. So if you select the Charles Bridge, you’ll see images at various time intervals. That’s not all – after you select “cameras in the area”, you will see a well arranged list of web cameras in different sites, with information on distances from the zero point – i.e., distances from the Charles Bridge. According to this site, the Nuselský Bridge is about five kilometers away, while Špindlerův Mlýn is 110 km away. Thanks to the online images, you can visit these places virtually. Lobbying essentially means directing information to target groups. This site of the Bison & Rose PR agency has information on pension reform for the Association of Pension Funds. According to this, in 2050 our overall pension system will be CZK 26,711,708,124 in the red. This is the first on-line DVD rental facility. You can choose a DVD over the internet, but you have to pick up and return it by mail, or in person. The advantage is a monthly lump sum for renting as many DVDs as you can watch. This site focuses on sports and activities in the country, from mountain-climbing to bicycling and skiing. The news is updated each day, and is supplemented by reportage on travels, advice, and discussions. “Six Senses” is a benefit (virtual) exhibition of artistic photography by well known actors, each of them representing one of the senses. It was organized by the ArtForum Association, which has long been promoting the conjunction of art presentations and the internet. – Internet logs became hugely popular, particularly during the war in Iraq, when the public saw the official media as manipulated and impersonal. Regularly updated entries from the “sand box” of the American soldier in Iraq (It-smash.us) or of an Iraqi man in Baghdad (dearread.blogspot.com) attracted and moved hundreds of thousands of computer visitors. 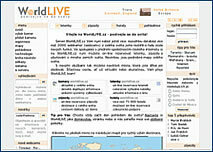 A Weblog is built on a simple editorial system that can be mastered even by computer novices. It has simple graphics and as few pictures as possible. 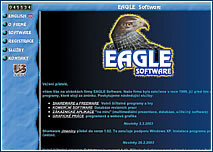 The operator of the system, which is usually free in its basic version, also offers space for placing sites – such as blogger.com or the Czech site, www.elka.cz/easyblog.